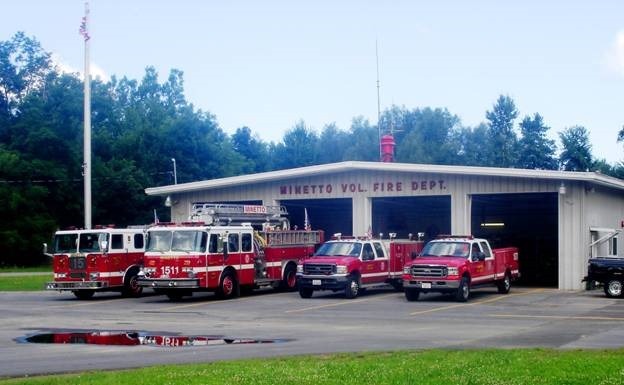 OSWEGO, NY – The Minetto Volunteer Fire Department will host its annual chicken BBQ on June 9 from 11 a.m. until sold out at the Minetto Fire Station, 12 Barrett Drive in Minetto. The dinner menu features ½ chicken, salt potatoes, baked beans, and a dinner roll for $10. Minetto Volunteer Fire Department, the site of the annual chicken BBQ, located at 12 Barrett Drive in Minetto, off of County Route 24; two miles off of County Route 48 or one mile off of West Fifth Street, Oswego. Customers can purchase a ½ chicken only for $4.50. In addition, there will also be a bake sale on site for customers to handpick a homemade dessert. “The funds we raise each year help us further support our community by giving us the means to live up to the Minetto Fire Department motto, ‘neighbors protecting neighbors,’” said corporation president Clark Stacks. Proceeds from the barbecue will go towards the general operating costs of the 100% volunteer serviced Minetto Fire Department. Dine-in and take-outs are available. Local delivery of five or more dinners may be arranged by contacting a Minetto Fire Department member by calling the fire station at 343-7566 on the day of the event. There are no presale tickets available, but customers can start calling ahead at 10 a.m. on June 9. For more information, call Chris Gentile at (315) 343-7566.